With our solar lighting solutions and Wi-Fi network solutions we unlock disadvantaged communities in emerging countries. This way we give them access to affordable clean energy, free education, free, open and secured communication and new job opportunities. 2000 people connected to our solar powered Wifi-network and built and implemented over 100 solar street lights and 150 solar home lanterns. Our next project: Kibagare slum, Nairobi, Kenya - Start project, June 2019 - What will we do? The slums of Kibagare, Kenya, are home to 20,000 people who have no access to electricity and digital information. Therefore we want to build and implement with its community 210 solar wifi boxes, 100 solar home lanterns for families and 100 solar street lights. This way we can give a part of the community access to affordable clean energy, free education, open and secure communication and new opportunities for work. Our next project: Kibegare slum, Nairobi, Kenya - Which impact do we want to create? 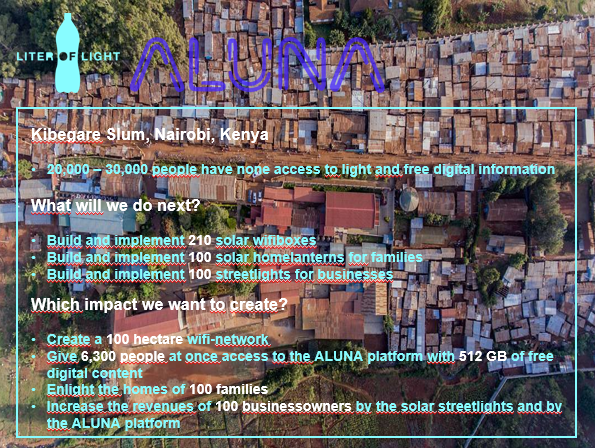 Create a 100 hectare Wifi-network, give 6,300 people at once access to the Aluna platform with 512 GB of free digital content, give the 35 women, who implement the solar wifi boxes a good and sustainable income, enlight the homes of 100 families in the Kibegare slum with our solar home lanterns, and increase the revenue of 100 business owners with help of the solar street lights and the Aluna platform.